Musk is adamant about being the first interplanetary litter-bug. The images are striking: a human-like figure, inside a cherry red Tesla Roadster, the Earth looming in the distance. And who, really, would want to be a killjoy about this? SpaceX launched that car and its dummy passenger, decked out in SpaceX’s new spacesuit, and blasting David Bowie’s “Space Oddity” into space on its Falcon Heavy rocket on Tuesday. The company’s stated goal? 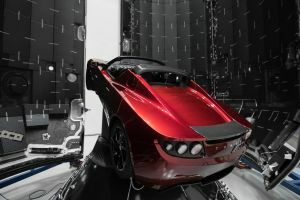 To send the Roadster into Mars’ orbit. The visuals are nothing short of arresting. Inspiring, even. But inspiring what, exactly? When you start to ask questions, they pile up. Quickly. What purpose does the Roadster actually serve? Why isn’t SpaceX running any tests on the vehicle? Or on the spacesuit? The kinds of tests that could, say, help the company evaluate its technology for its highly-anticipated manned mission to Mars? Because the facts are thus: The dummy isn’t exactly gonna be taking hot laps around Mars. The electric vehicle won’t somehow end up on the planet’s surface ready to drive for inevitable human visitors. And so on. So while the launch might be a precedent-setting event for private space exploration, it’s difficult to see past the P.T. Barnum-based aspects of it as a marketing stunt — and one that also adds willy-nilly to the growing collection of space junk collecting around Earth. And yeah: Space junk is a serious problem. There are more than 500,000 pieces of debris orbiting Earth. This space junk poses a real danger for astronauts, spacecraft, and satellites, which could collide with the stuff – throwing the active craft out of orbit or even damaging it beyond repair. As we’ve sent more missions to Mars, humans have begun cluttering up that planet’s orbit, too. The Tesla roadster is destined to become the most recent addition. That’s dangerous for future Martian astronauts (imagine if Sandra Bullock got clipped by a cherry red Roaster blasting David Bowie instead of a satellite. Because, uh, it could actually happen), not to mention irresponsible. Nothing says “good samaritans of the solar system” like treating another planet like our species’ personal garbage dump. If the Tesla isn’t doing any good at its destination, then perhaps it provides some benefit back on Earth. Here, its value becomes clear: the beautiful images of a car in space allow Musk to sell more cars. Musk is, of course, no stranger to atypical marketing schemes — his companies have sold logo-emblazoned hats, donated batteries to hospitals in hurricane-wrecked Puerto Rico, and hawked flamethrowers on social media. All of these endeavors have, of course, added to Musk’s astronomical wealth. And as much as you might begrudge him potentially endangering the lives of future Mars-bound astronauts, within the context of selling a show, the knack for marketing is almost as ground-breaking as the launch itself. Launching a nearly 3,000-pound car on top of a rocket isn’t exactly free, but it’s a pretty compelling medium for selling more product. We’re gonna be seeing photos like the one above for years to come. Maybe it’ll even convince some people to buy a Tesla. To that end: Game recognize game. Here’s hoping nobody ends up on the losing side of Musk’s game, in a future either far off or not-too-distant, by getting into an intergalactic fender bender with Musk’s floating lemon.